I fell down the stairs a week or so ago. In the dark, around midnight, with my hands full. This is the recipe for falling down the stairs. I only fell down the last stair or two (thinking that I'd already reached the bottom). My knee was twisted at a horrible angle and I've spent a lot of my time lately on my back with my leg propped up in the air. 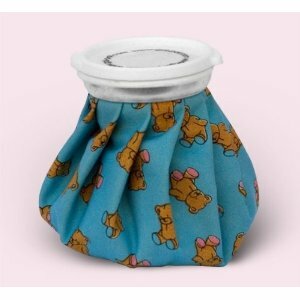 I haven't been on the computer as much as normal since I'm "old fashioned" and have a desk computer, but I have found random things to mention (aside from my cute ice pack). I have to tell you about Pinterest. Back in the day I had very well organized bookmarks on my computer with things I wanted to make in the future, things that inspired me etc... This is like having well organized bookmarks, but with PICTURES! You can also see things that other people have "pinned" to their "bulletin boards" and re-pin them to your own boards. I now have all sorts of ideas organized on Pinterest for upcoming birthday parties and crafts that I hope to make in the future. If you want an invitation you can e-mail me or leave your e-mail address in the comments. You have to see it to fully appreciate it! oh my goodness Chelsey I hope you're okay, the stair thing sounds FREAKY! Oh no!! poor you. I hope you recover soon. I hope you are doing better! I love the yogurt tube idea for kids! I will totally use that! I keep hearing about Pinterest. I'll have to check it out sometime.